NETCARE (Network on Aerosols and Climate: Addressing Key Uncertainties in Remote Canadian Environments) is a large research network focusing on aerosol–cloud–climate interactions. While Canadian-based, it operates with many international collaborations. It is comprised of scientists working in both atmospheric science and marine biogeochemistry, with particular attention given to a suite of intensive field measurements (with both atmospheric and oceanic components) and model evaluation and development. There are three major research directions within the network: 1. Carbonaceous Aerosol, 2. Arctic Clouds, and 3. Ocean–Atmosphere Interactions. A large amount of the research has an Arctic focus, it being a region especially susceptible to anthropogenic input and experiencing a large degree of biogeochemical change. The website for the network is http://www.netcare-project.ca/ . On the website, there is more information on research activities, field campaign details, modeling activities, data products, and personnel. We investigated the importance of mineral dust, sea spray aerosol, and anthropogenic aerosol to the ice-nucleating particle (INP) population in the Canadian Arctic during spring 2016. The results suggest that mineral dust transported from the Gobi Desert was a major source of the INP population studied, and that sea spray aerosol decreased the ice-nucleating ability of mineral dust. The results should be useful for testing and improving models used to predict INPs and climate in the Arctic. Summertime Arctic atmospheric aerosols are strongly controlled by processes related to natural regional sources. We use a chemical transport model with size-resolved aerosol microphysics to interpret measurements made during summertime 2016 in the Canadian Arctic Archipelago. Our results explore the processes that control summertime aerosol size distributions and support a climate-relevant role for Arctic marine secondary organic aerosol formed from precursor vapors with Arctic marine sources. The Arctic is experiencing considerable environmental change with climate warming, illustrated by the dramatic decrease in sea-ice extent. It is important to understand both the natural and perturbed Arctic systems to gain a better understanding of how they will change in the future. This paper summarizes new insights into the relationships between Arctic aerosol particles and climate, as learned over the past five or so years by a large Canadian research consortium, NETCARE. 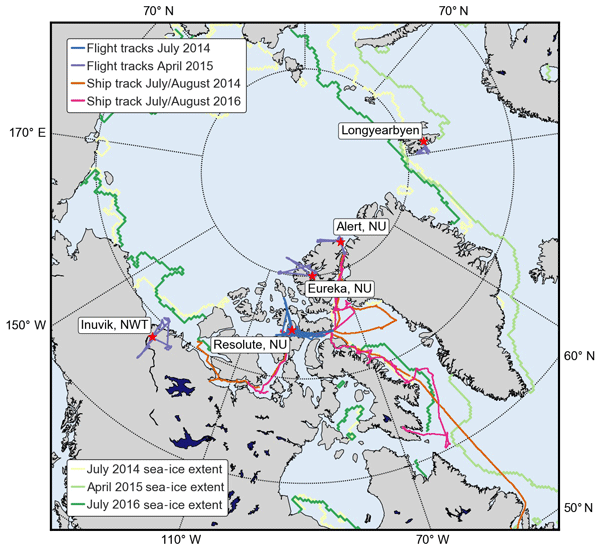 We present airborne trace gas measurements in the European and Canadian Arctic for July 2014 and April 2015. Based on CO and CO2 in-situ data as well as 10-day kinematic back trajectories we characterize the prevailing transport regimes and derive a tracer based diagnostic for the determination of the polar dome boundary. Using the tracer derived boundary the analysis of the recent transport history of air masses within the polar dome reveals significant differerences between spring and summer. Ice nucleating particles (INPs) are atmospheric particles that catalyse the formation of ice crystals in clouds. INPs influence the Earth's radiative balance and hydrological cycle. In this study we measured the concentrations of INPs in the Canadian Arctic marine boundary layer. Average INP concentrations fell within the range measured in other marine boundary layer locations. We also found that mineral dust is a more important contributor to the INP population than sea spray aerosol. The vertical distribution of Arctic aerosol is an important driver of its climate impacts. We present vertically resolved measurements of aerosol composition and properties made in the High Arctic during spring on an aircraft platform. We explore how aerosol properties are related to transport history and show evidence of vertical trends in aerosol sources, transport mechanisms and composition. These results will help us to better understand aerosol–climate interactions in the Arctic. The ocean is a source of atmospheric ice nucleating particles (INPs). In this study we compared INPs measured in microlayer and bulk seawater in the Canadian Arctic in 2016 to those measured in 2014. 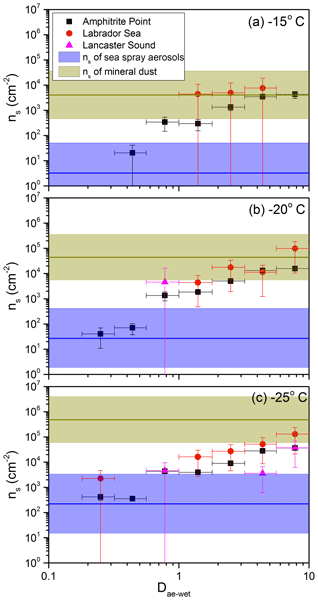 A strong negative correlation between salinity and freezing temperatures was observed, possibly due to INPs associated with melting sea-ice. In addition, although spatial patterns of INPs and salinities were similar in 2014 and 2016, the concentrations of INPs were on average higher in 2016. The mixing state of black carbon is one of the key uncertainties limiting the ability of models to estimate the direct radiative effect. In this work, we present aircraft measurements from the Canadian Arctic of coating thickness as a function of black carbon core diameter and black-carbon-containing particle number fractions. We use these measurements to inform estimates of the direct radiative effect in Arctic aerosol simulations. Melt ponds (MP) forming over first year ice (FYI) represent a potential source of the climate-relevant gas dimethylsulfide (DMS) to the atmosphere. Nine MP were sampled in the Canadian Arctic Archipelago. DMS concentrations reaching up to 6 nmol L−1, twice the world's surface oceanic mean, were measured. Seawater intrusion appeared to seed MP with DMS-producing communities. DMS flux from Arctic MP is expected to increase in response to the expanding areal and temporal trends of MP on FYI. Atmospheric aerosols, tiny airborne particles, have an important impact on climate. However, a lack of understanding of the chemistry of aerosols is one of the largest contributors to uncertainty in predictions of climate change. Measurements of aerosols were carried out in Eureka, Canada in the Arctic to better understand what role aerosols play in this fragile environment. It is found that organic aerosols, possibly originating from marine emissions, are ubiquitous during summertime. We conducted aircraft-based single particle chemical composition measurements in the Canadian high Arctic during summer. Our results provide evidence for a marine-biogenic influence on secondary formation of particulate trimethylamine in the Arctic boundary layer. Understanding emission sources and further processes controlling aerosol number concentration and chemical composition in the pristine Arctic summer is crucial for modeling future climate in the area. The sources of aerosol particles and their growth to sizes large enough to act as cloud droplet seeds is of major importance to climate since clouds exert substantial control over the atmospheric energy balance. Using ship-board measurements from two summers in the Canadian Arctic, aerosol formation events were related to co-sampled atmospheric and oceanic parameters, providing insight into factors that drive particle formation and motivating further study of ocean–atmosphere interactions. We interpret a series of recent airborne and ground-based measurements with the GEOS-Chem model and its adjoint to attribute the sources of Arctic BC. Anthropogenic emissions in eastern and southern Asia make the largest contribution to Arctic BC. Gas flaring emissions from oilfields in western Siberia and from the Tarim oilfield in western China could have striking impacts on Arctic BC loadings. The ocean is a possible source of atmospheric ice-nucleating particles (INPs). In this study we found that INPs were ubiquitous in the sea-surface microlayer and bulk seawater in the Canadian Arctic. 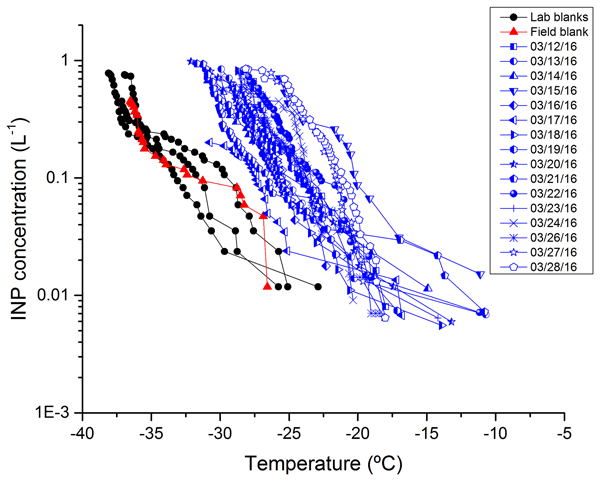 A strong negative correlation was observed between salinity and freezing temperatures (after correcting for freezing point depression). Heat and filtration treatments of the samples showed that the INPs were likely biological material with sizes between 0.02 μm and 0.2 μm in diameter. We present spring and summertime vertical profile measurements of Arctic dimethyl sulfide (DMS), together with model simulations to consider what these profiles indicate about DMS sources and lifetimes in the Arctic. 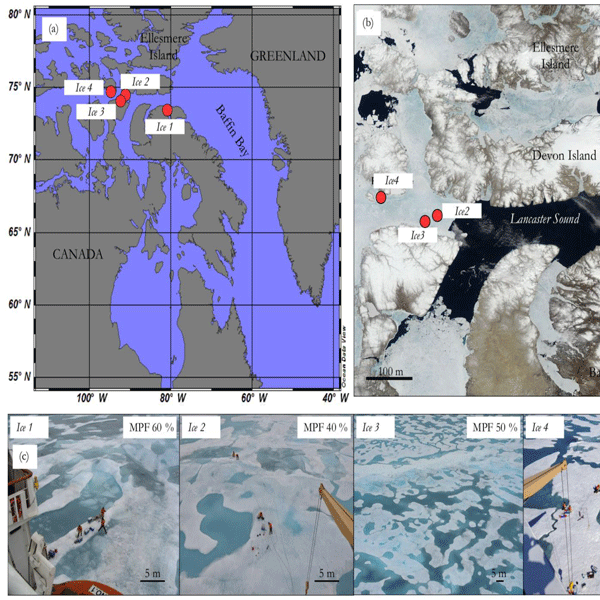 Our results highlight the role of local open water as the source of DMS(g) during July 2014 and the influence of long-range transport of DMS(g) from further afield in the Arctic during April 2015. In remote regions, cloud conditions may be strongly influenced by oceanic source of dimethylsulfide (DMS) produced by plankton and bacteria. In the Arctic, sea ice provides an additional source of these aerosols. The results of this study highlight the importance of taking into account both the sea-ice sulfur cycle and ecosystem in the flux estimates of oceanic DMS near the ice margins and identify key uncertainties in processes and rates that would be better constrained by new observations. 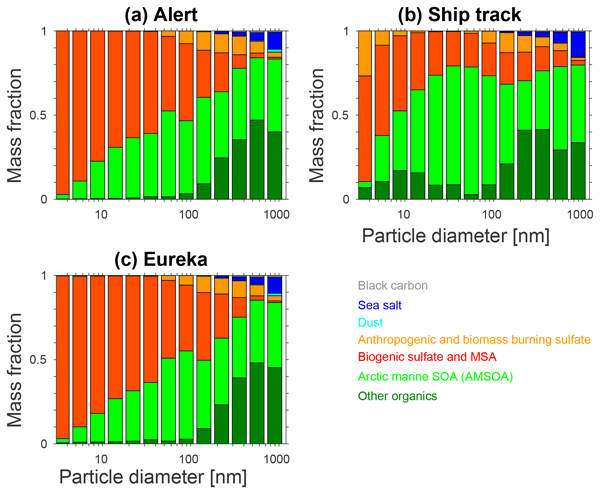 This study assesses the impact of ocean acidification on phytoplankton and its synthesis of the climate-active gas dimethyl sulfide (DMS), as well as its modulation, by two contrasting light regimes in the Arctic. 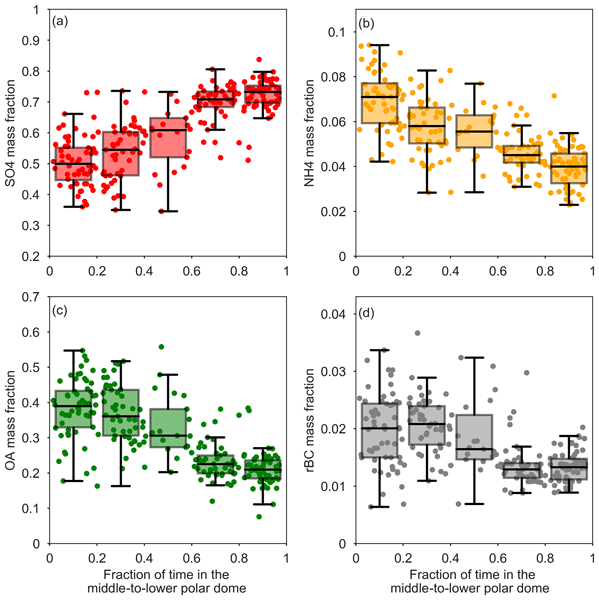 The light regimes tested had no significant impact on either the phytoplankton or DMS concentration, whereas both variables decreased linearly with the decrease in pH. Thus, a rapid decrease in surface water pH could alter the algal biomass and inhibit DMS production in the Arctic. Our aircraft study for the first time systematically investigates aerosol size distributions, including ultrafine particles (5–20 nm in diameter), in the Arctic summertime atmosphere. We find that ultrafine particles occur very frequently in the boundary layer and not aloft, suggesting a surface source of these particles. Understanding aerosol properties and sources is crucial to predict climate and especially important in the Arctic as this region responds extremely fast to climate change. The first airborne measurements performed with the FIRR are presented. Vertical profiles of upwelling spectral radiance in the far-infrared are measured in the Arctic atmosphere for the first time. They show the impact of the temperature inversion on the radiative budget of the atmosphere, especially in the far-infrared. The presence of ice clouds also significantly alters the far-infrared budget, highlighting the critical interplay between water vapour and clouds in this very dry region. Thought to be mostly unimportant for summertime Arctic liquid-water clouds, airborne observations show that atmospheric aerosol particles 50 nm in diameter or smaller and most likely from natural sources are often involved in cloud formation in the pristine Arctic summer. The result expands the reference for aerosol forcing of climate. Further, for extremely low droplet concentrations, no evidence is found for a connection between cloud liquid water and aerosol particle concentrations. For the first time, ship emissions of an ice-breaker, the Amundsen, is characterized while breaking ice in the Canadian Arctic using the plume intercepts by the Polar 6 aircraft. The study is novel, estimating lower plume expansion rates over the stable Arctic marine boundary layer and different emissions factors for oxides of nitrogen, black carbon, and carbon monoxide, compared to plume intercept studies in mid latitudes. These results can inform policy making and emission inventory datasets. We present a case study focused on an aerosol growth event observed in the Canadian High Arctic during summer. 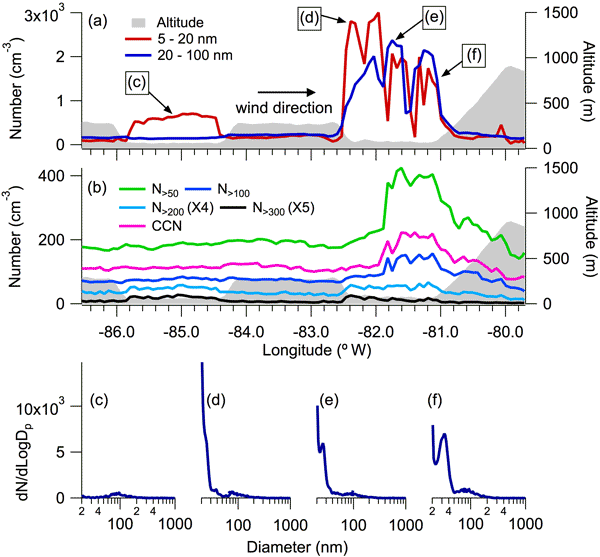 Using measurements of aerosol chemical and physical properties we find evidence for aerosol growth into cloud condensation nuclei-active sizes, through marine-influenced secondary organic aerosol formation. Understanding the mechanisms that control the formation and growth of aerosol is crucial for our ability to predict cloud properties, and therefore radiative balance and climate. Previous work has suggested that marine emissions of dimethyl sulfide (DMS) could impact the Arctic climate through interactions with clouds. 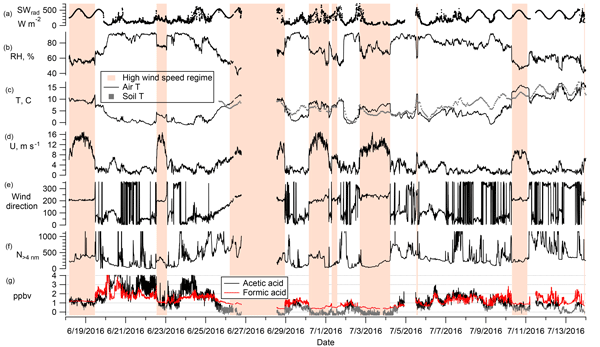 We made the first high-time-resolution measurements of summertime atmospheric DMS in the Canadian Arctic, and performed source sensitivity simulations. We found that regional marine sources dominated, but do not appear to be sufficient to explain our observations. Understanding DMS sources in the Arctic is necessary to model future climate in the region. Here we present a radiometer, FIRR, aimed at measuring atmospheric radiation in the far infrared, an underexplored region of the Earth spectrum. The FIRR is a prototype for the planned TICFIRE satellite mission dedicated to studying thin ice clouds in polar regions. 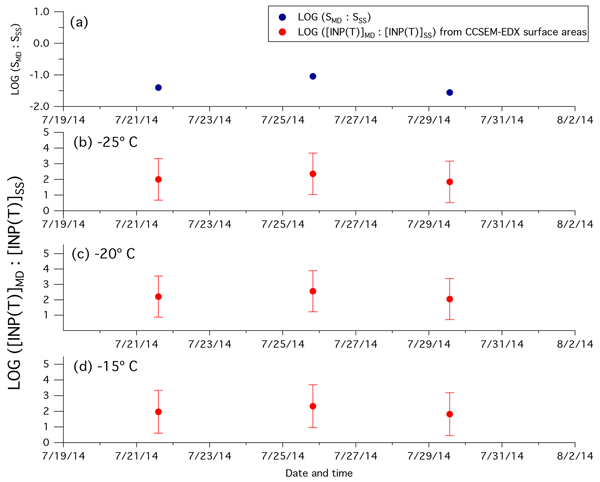 Preliminary in situ measurements compare well with radiative transfer simulations. This highlights the high sensitivity of the FIRR to water vapor content and cloud physical properties, paving the way for new retrieval algorithms. Measurements at high-Arctic sites show a strong annual cycle in atmospheric particle number and size. Previous studies identified poor scientific understanding related to global model representation of Arctic particle number and size, limiting ability to simulate this environment. 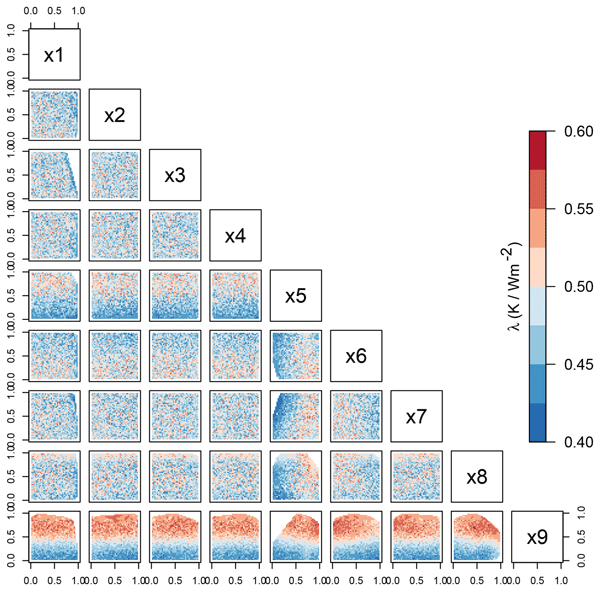 Here we evaluate state-of-science ability to simulate Arctic particles using GEOS-Chem-TOMAS model, documenting key roles and interconnections of particle formation, cloud-related processes and remaining uncertainties. Air near the surface in the summertime Arctic is extremely clean and typically has very low concentrations of both gases and particles. However, atmospheric measurements taken throughout the Canadian Arctic in the summer of 2014 revealed higher-than-expected amounts of gaseous ammonia. It is likely the majority of this ammonia is coming from migratory seabird colonies throughout the Arctic. Seabird guano (dung) releases ammonia which could impact climate and sensitive Arctic ecosystems. 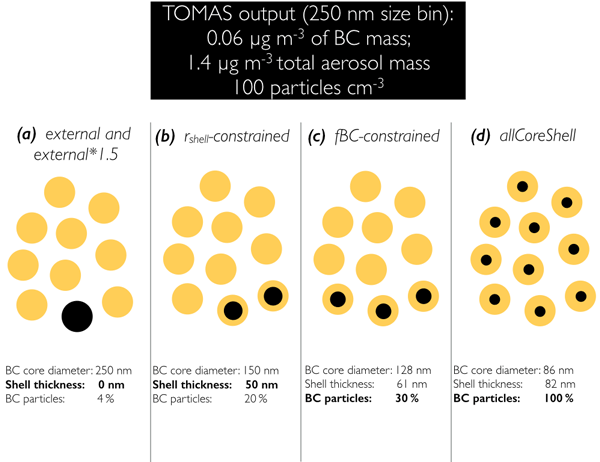 In this paper we show that coagulation of cloud droplets with interstitial aerosol particles, a process often neglecting in atmospheric aerosol models, has a significant impact on aerosol size distributions and radiative forcings.